As always, if you have any comments about the newsletter or any of the information featured in this issue, we'd love to hear from you. Please e-mail your feedback by clicking here. Let’s talk about how to make sending and receiving programs to your CNCs as reliable and efficient as possible. Many shops have been attempting to work out this problem; some have succeeded and others know that things could be done better. The Mazak CNC (with Mazatrol programs) has a number of methods (varying over the Mazak generations) of communicating / transferring Mazatrol programs to and from the Mazak CNC. First, let’s start with the basics. What is CMT? The first Mazatrol control, the T1, saved programs to a Cassette Magnetic Tape, and hence the abbreviation “CMT”. 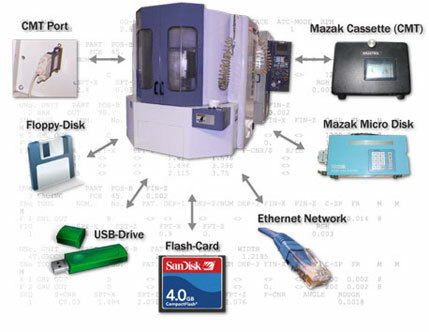 This used a serial-port (“RS232”) to communicate between the Mazak CNC and the Cassette (CMT) unit. This “CMT-I/O” uses the same 25-pin connector found on the earlier IBM-PC compatible computer, and later the IBM-PC changed it to a 9-pin configuration (although the Mazak remained at the standard 25-pin configuration, it is a simple wiring adapter difference). Note that while the RS232 connector is industry-standard, the “CMT-I/O” communications “language” that the Mazak communicates with over the cable is not the industry standard, and requires special software to communicate (such as Mazak Corp’s “MDT” software or SolutionWare Corp’s MazaCAM software). Ethernet Network connections became available starting with the Fusion generation (as an inexpensive option) and continued on later generations. Files can now be transferred via the Network to a computer acting as a file server. This type of communications does not require the plugging and unplugging of hardware, thus less wear and tear on your machine and less chance of getting chips on your connectors. Mazak CNCs, depending of the generation, have other methods of transferring programs with various types of hardware. Fusions and Fusion-Pro controls have a Windows-compatible floppy-disk and may have a “Compact-Flash”-Card where available. The Matrix control replaced the floppy-disk with the more reliable USB drive. "CMT-I/O” RS232: has the potential of transmission errors when transferring Mazatrol programs. Plusses are it is standard on all controls prior to the Matrix, and there is no chance of transferring a virus via a standard RS232 data transfer. Network connection: (available on Fusion and later) if done correctly this can be virtually virus-free and is the best method. On the other hand, if done incorrectly or proper policies are not enforced, this can be the most common method of virus-infection. Wireless Ethernet: With the Ethernet interface, one can use various wireless Ethernet units available. The minus is sometimes the signal is unreliable. The plusses are no electrical connection means protection from electrical surges and lightning. And no need to run wires all the distance across the shop. USB-drive: (available on Matrix) is the simplest method to transfer programs as it requires virtually no configuration. But can transfer a virus (since Windows automatically runs certain files if it finds them on the drive when it is inserted, and these can be virus-infected). It is vital that you make sure any USB-drive used for program transfer is verified virus-free regularly. Compact-Flash "Card": is pretty much the same plus/minus as USB-drive. Floppy-disk: Although if used properly, this method can be kept virus-free, data retention is not completely reliable on a floppy-disk. Wireless RS232: While this can eliminate wiring and protect from electrical surges and lightning, some units do not work well with Mazaks, and sometimes the signal is unreliable. Set-up is more complicated then simply running a wire. For further information on these topics (or any Mazatrol or CNC programming topic), see our website CNCproductivity.com or contact us at 408-249-1529 or 888-322-3226 toll-free in the USA. If you would like to make comments on this Machining in the ZONE go to TheMazatrolAdvantage.com, and join the forum.